Pokémon Omega Ruby & Alpha Sapphire will arrive in November with a host of new features not possible in the Game Boy Advance originals. There'll be substantial online modes, Super-Secret Bases and a variety of Mega evolutions. Like Pokémon X & Y, it'll also utilise a 3D graphics engine. It's possible that 3DS owners will be a tad blasé about the new visuals when these enhanced remakes come around, as X & Y didn't have such direct points of comparison in terms of characters and environments. Omega Ruby & Alpha Sapphire do, however, and YouDontKnowThisUser has posted a rather cool collection of images that highlights the advances that two generations of portable systems have brought; it emphasizes how different the 3D engine is compared to the GBA's visuals. Check it out below and let us know whether it boosts your hype levels for this one further. I can still remember playing the original Sapphire and thinking how much of an improvement was made in graphics over the original Red and Blue. Seeing these games coming back has made me all nostalgic and giddy! The current camera set up works great for indoor areas and caves and such. However, they should have zoomed it out more on the outdoor areas to avoid the more claustrophobic feeling that is caused by the smaller field of view. You can even see how in that one cave they removed the circle overlay since it wasn't necessary to obscure the players view. Other than that it is a general improvement from the original. God im so hyped for this. Nintendo/Game Freak, I'll become slightly inclined to buy this when you fully implement the 3D. Seriously - just because you're Pokémon doesn't mean you can be lazy. Hype level through the roof! @Geonjaha The problem is that 3D already had issues with frame rate when it was on (especially if you battled a Butterfree/anything that flies by flapping wings). It seems like this could be a problem in this game as well judging by the screenshot with the Beautiflys flying around above the grass (screen shot 11). Who knows though, maybe Gamefreak has had some time to work out any kinks in their engine before starting work on these remakes. So excited for these games. November 21st can't come fast enough. Those new images look amazing and I am so glad I pre-ordered OR/AS. @Ernest_The_Crab - Most other games on the 3DS managed to give players the option to use 3D. I'm always one to sacrifice a bit of frame rate for the 3D effect because I really enjoy it. Besides, most of the screenshots of the world shown there could easily use 3D without killing the frame rate (If it managed to look like a full open 3D world I wouldn't be asking). Remember that A Link Between Worlds managed 60fps with 3D on, and this game doesn't look much more graphically impressive. I'd settle for 30fps if the 3D is nice. @Samuel-Flutter Same here. 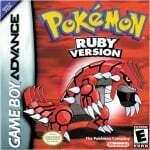 I was astounded at how much Ruby and Sapphire improved over Crystal, but I was disappointed that Pokemon didn't move in Ruby and Sapphire. Now, with X, Y, OR, and AS, I am astounded that they are in 3D. I guess, with whatever handheld comes next, that I will be astounded by HD Pokemon. Seeing scales on Gyarados, feathers or Pidgeot, or even more realistic flames on a Charizard. Those are thing I used to only dream about, and now we are basically just on step away! @Geonjaha Oh, I know. It was a little disheartening to have static sprites after Crystal, but I didn't care because Pokemon is awesome. I was also glad that my save data was no longer tied to the life of a battery as well. I lost my progress on Red, Yellow, Gold, Silver, and Crystal because of the stupid batteries, but starting with Ruby and Sapphire they fixed that. The only thing that annoys me about Pokemon games now is that the Vs. Seeker and the Pokeradar are not standard in every region. HG, SS, B,W,B2, and W2 all should have at least had the Pokeradar, imo, and OR and AS better have it too. I am glad X and Y have it, even if it the region isn't designed for it. I definitely prefer GBA graphics than X/Y. @HandheldGuru97 I've never seen that gif animated before, but its even better! I'm insanely excited to return to Hoenn, my favorite Pokemon region. I might get both so I can do weird playthroughs like only using Kecleon. They aren't very impressive, the cave looks actualy worse than the original. @Ernest_The_Crab I'm speculating but I think their programmers don't know how to handle the 3D overworld and 3D effect. The way how you move in Lumiose made me think they didn't know how to make controls for a full 3D game, the lags during battles with 3D effect on made me think about badly scripted code or something like that (look at that Smash game that is going to be released on 3DS - 4 greatly polygoned and textured models on the screen with 60fps graphics and some background characters with 30fps plus quite impressive backgrounds during the fights). It my be the 3DS fault but personaly I belive they didn't know exactly what to do to get the right effect. I still have a sweet spot for those GBA graphics. I always liked the style of GBA Pokemon and it's very nostalgic for me, but honestly I couldn't like another 2D Pokemon game that much now that they switched to 3D-ish style. I am so so so much more excited for these than XY ever and I was hugely excited for XY too! New Rustboro gym is so much bigger on the inside though. Wtf. @Geonjaha Agreed. The lack of polish in X and Y was understandable given the fact that the visual style had changed so much from the older games, but a big priority for Game Freak now should be figuring out how to properly implement the 3D. I've never played any of the gba pokemon games, so I get a whole new pokemon game for the price of a remake. @Link506 Sadly the price of a remake is the same as an original game. I didn't play X and Y, but the camera angle worries me. It seems way too low. Anybody know if they are ever updating the 3DS Pokedex Pro my kids each paid $15 for w/ the X and Y Pokemon? Seems only right that they should, it's their Pokemon, their app, it's called "Pro",and it's missing over 100 Pokemon, mega evolutions and the fairy type. People who make free apps are usually better at keeping up w/ stuff than Nintendo. On topic, the screen shots look real good. My kids still don't seem to care too much about graphics - they would have beene more than happy just to buy $10 ports of the originals which they never played, but I'm sure they'll like the new look. The GBA visuals of Pokemon will always be my favorite. The Game Boy Advance screens actually look better to me, but as with X and Y the 3DS game will look brilliant when playing, much more than it does in stills. Now that's the way you hype! @xerneas Its made with the materials from the Tardis. Thats what I'm thinking too. People probably don't realize it but Game Freak hasn't actually done any 3D games themselves. Stadium and Snap were handled by HAL, Mystery Dungeon was all Spike Chunsoft, and the Gamecube games were Genius Sonority. So X&Y were their first ever 3D games in 25 years. That being said I don't think they did that bad, its how they do going forward thats really important. So far OR/AS look like a nice improvement over both the originals and X/Y. I prefer the GBA visuals though I really hope Tate and Liza have their much more difficult combo from Emerald, Xatu and Claydol makes a difference! I'm not even excited for this because of smash, but I would be very hyped if there was no smash 3ds. I'll almost certainly still buy this. Battle environments look way better than XY, cool! The GBA graphics will always remain my favourite. This game is a must though; hit me right in the nostalgia. This has gotten me way more excited than I was for X/Y. Although GBA graphics have aged gracefully as they still look appealing to me, travelling through the same environments as before in 3D will also be amazing experience. X/Y came out on my birthday and this is coming one day before. It is going to be an awesome November! Hope the gym battles are more challenging and more interesting., and Steven is as a great champion he was before. Is Minun evolving is this collage? These pictures just make me realise..... how damn ugly the GBA originals were. I really hated the art direction back then, but the remake looks tons better. @Zombie_Barioth The ingame battles looks delicious though (even without 3D effect (or barely visible 3D effect when it's on)), they certainly put their efforts into the models and their animations. Though I'm pretty sure they used the same models that were used for Pokedex 3D pro, with some models updated/corrected (I judge that because I compared few pokemom from both softwares, especialy Kangaskhan and Venusaur and Raikou face bug). But if that's the case, the models were made by Creatures, not GameFreak. Speaking of models... I hope for a little bit more animated pokemon in Amie. Some critters there are pretty... stiff. 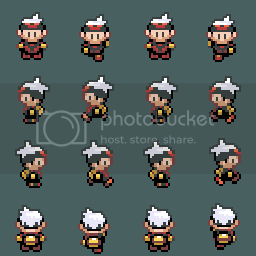 Maybe nostalgia is taking over but I like the GBA sprite graphics more (could have something to do with the trainers hair being silver and not a hat). The new engine makes me feel weird as it is the same game but it isn't at the same time. They probably did, they did the same for the Gamecube games, both colosseum and XD used the Stadium models for the original 251. It makes more sense to reuse those than make them all from scratch. And yea, I really hope they work on amie and expand on it a bit. With contests making a return they just might too, the two fit nicely together. You know its been a hat all along, right? You can see his real hair even on the sprite. Or at least I hope so, otherwise he'd have to have dyed his sideburns black or something. These were the games, that got me to quit Pokemon for good until X and Y came around. @Zombie_Barioth I've known it is a hat for years but when I first played it I thought it was hair due to the character sprite having so many spikes and I thought the black bit was a headband. Looking forward to playing it! Don't know if I'll be able to get it at launch due to money issue sadly. Loving the updates, thanks for sharing =D. Mostly because I'm thinking the same thing, but seriously, given how long overdue SSB43DS is, I always fear for the 3DS version being cancelled all of a sudden. It's a scary and depressing thought. As for me, though, I'm still into these remakes, if only for the cathartic factor of wiping the floor with the Hoenn Pokémon League with Johto Pokémon (because of the whole "not compatible with Gold and Silver" thing, thank goodness for the Pokémon Bank). That, and also the fact that unlike with Pokémon X, I'm going for a physical copy this time around, what with my digital X acting screwy - lately, it's gotten a bit laggy (such as, for example, having to wait up to five seconds between the start of the battle music and the opponent's artwork finally popping up, and similar issues), and come to think of it, I'd like to hear something from @Serebii given he might well be way more informed than me when it comes to technical issues, glitches and whatnot. I'd enlist the NL staff as well, but I don't want to bother anyone more than I just have done. What do you mean? Can I do anything about it? Wait, NOW I get it. It's like the thing that happens with PCs when they start getting slower and slower, because the free space in the HDD is kind of messed up, and it needs to activate the lengthy defragmentation process. Okay, so it's not quite as much of a serious issue as I made it out to be. Good. As long as my game still works, I can chill. I hope you can customize him. When the announce remakes of gene 3, I was happy. Then they said "secret bases are back and better than before." That's what got me SUPER EXCITED for O. Ruby & A. Sapphire!!! X & Y spoiled me with customizations....so I highly doubt you we can customize ourselves in terms of clothing and accessories. If they allow me to change the color of my bandana, I'll be content with that! It's good enough for me. I seen your gif and legit thought I was tripping.